– Slide the switch A ⇒ fig. 95 to the right to release the ashtray. – Take out the ashtray B ⇒ fig. 95. 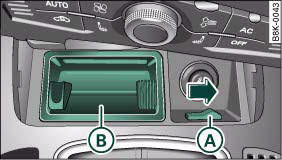 – Pull the front lip of the ashtray B ⇒ fig. 96 in the direction of the arrow. – Press down the retainer A and take out the ashtray. 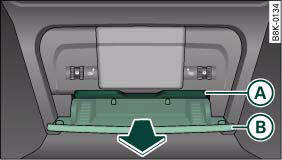 – Place the ashtray in the holder.